One reason lab suppliers are successful in selling lab equipment at Biotechnology Calendar, Inc. life science marketing events is that the universities we work with are highly funded. Researchers at the Texas Medical Center conduct innovative research every year. The NIH, NSF and other private donors give these researchers millions of dollars in life science research funding. Part of this funding is spent on lab products and services, making it easy for lab suppliers to sell lab equipment at our Texas Medical Center life science marketing event. Researchers trust the companies who exhibit at our events, and they know that at our shows they will be able to find a friendly sales rep who can help them solve their problems in the lab. 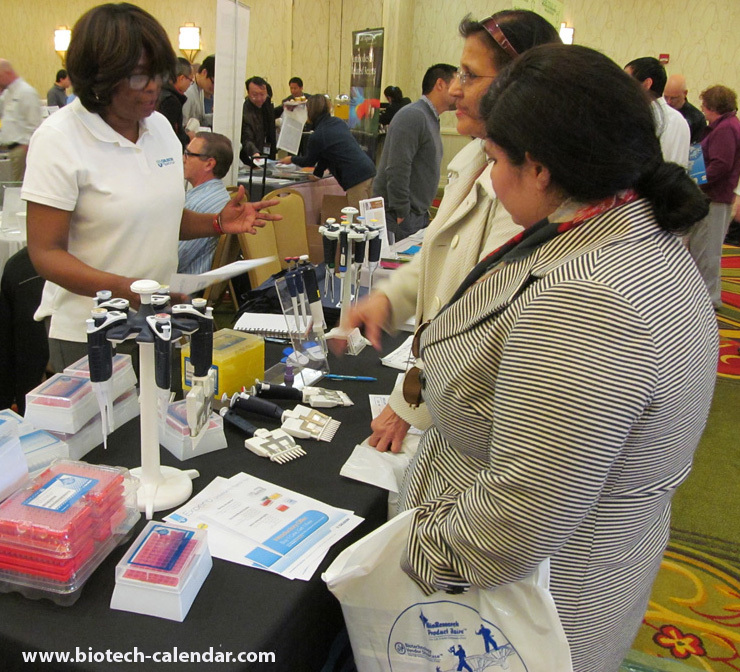 Lab supply companies market their products to life science researchers at the 14th annual BioResearch Product Faire™ Event in Houston in 2015. Lab suppliers who have exhibited with Biotechnology Calendar, Inc. value our events because we provide customizable life science marketing opportunities. We offer three levels of sponsorship packages. Some of the features of these packages include quarter-page, half-page or full-page advertisements in our event programs, sponsorship ribbons and distribution rights to lanyards and event bags. Lab suppliers also have the option to purchase a sponsorship package that gives them access to an extended mailing list of event attendees. This list is double-checked for accuracy to save sales reps time when reaching out to attendees they met or may have missed at our Texas Medical Center life science marketing event. Biotechnology Calendar, Inc. is a full service science research marketing and events-planning company that has more than 20 years of experience producing laboratory supply life science marketing events. We invite lab suppliers interested in selling lab equipment and taking advantage of life science marketing opportunities in Houston to attend our Houston BioResearch Product Faire™ Event on January 29th, 2015. If you are interested in selling lab equipment at life science marketing events closer to home, we encourage you to view our 2015 trade show calendar. For more funding information on the Texas Medical Center, or to learn more about our Houston BioResearch Product Faire™ Event, click on the button below. This is an updated version of a previously published article which can be viewed here: Sell Lab Equipment at Texas Medical Center.